Carl Zeiss Contact Day 30 Spheric lenses are an excellent choice for anyone who works long hours on a computer or in air-conditioned environments. 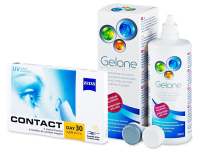 This package contains a 360 ml bottle of Gelone contact lens solution and an antibacterial lens case. Contact Day 30 Spheric lenses are produced by Carl Zeiss and have a monthly replacement schedule. Their advanced design combines thin edges with very good lens stabilisation, and they are available in a wide range of prescription strengths. The balance between water content and oxygen permeability ensures a seamless fit, even during extreme conditions, such as working at the computer or in heated or air-conditioned spaces.